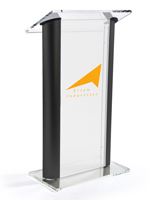 Looking for a custom printed podium to add branding information and graphics to business or facility presentation furniture? 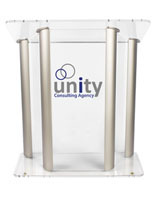 Promotional messaging, company identity information, and business logos help build audience recognition during speeches, presentations, lectures, debates, readings and even sermons or ministry. 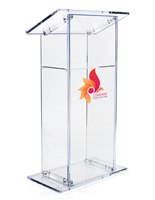 Professional quality custom printed podiums can range from showcasing simple branded single-color graphics to full-color photo-quality digital printing. 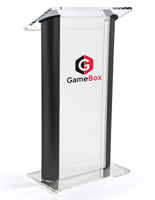 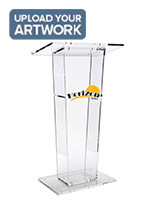 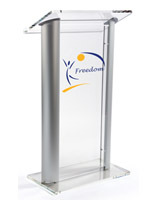 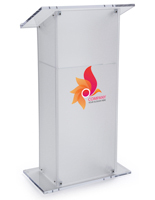 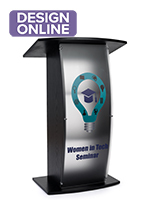 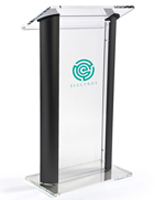 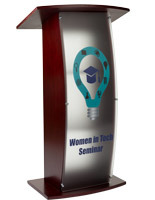 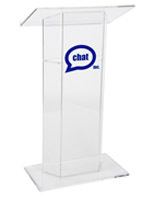 Podiums2go.com offers a wide variety of speakers' stands that can be personalized to meet the branding and identity needs of any business, organization, or facility. 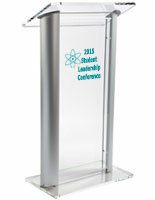 Styles and configurations include lightweight, portable acrylic or aluminum truss lecterns that can be easily moved from place to place, making them ideal for off-site events such as trade shows or promos. 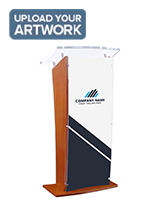 Wooden custom printed podiums, frequently called contemporary graphic speakers' stands, combine rich wood finish laminates with imprinted front panels for a look that combines high visibility branding with traditional design. 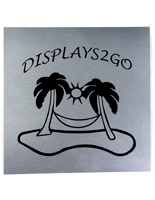 Our in-house printing capabilities include single and multi-color vinyl imprints for simple vector graphics and text logos, as well as cutting edge UV digital imprints that provide full color, photographic quality reproduction on a variety of different surfaces. What are the differences between the two printing processes used to customize lecterns and speaking or presentation furniture? 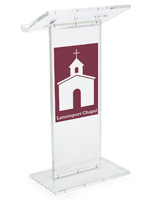 Computer-cut vinyl graphics are ideal for logos with simple vector artwork and large lettering. 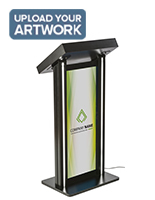 This is a great choice for promoting a business with corporate logos and other simple messaging. 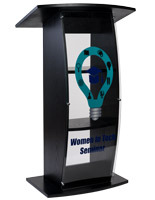 For example, it's better to have a school's name and symbol rather than a realistic advertisement. 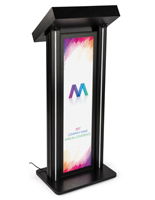 This style of graphics comes in 1- or 2-colors only, but they still create vibrant displays that can attract uninformed passersby from a distance. 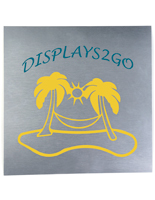 The computer-cut process provides precision and a long-lasting image that can be used in high traffic environments and outdoor locations. 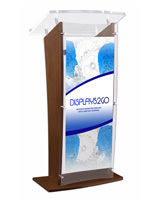 Full color UV digital process that can create photorealistic graphics on acrylic and podiums with plexiglass panels. 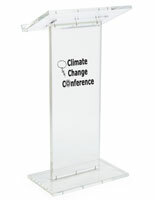 This kind of printing is made with a high tech inkjet flatbed printer that prints directly onto materials permanently. 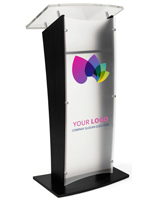 The lecterns with logo printing are instantly cured with ultra-violet lights that dry the ink into a high quality imprint. 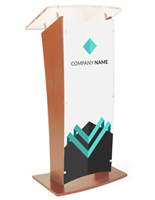 Digital prints also feature a larger area on podiums, allowing them to be more readable and recognizable from a distance at busy trade shows. 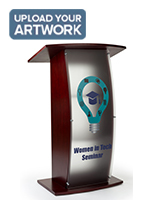 Businesses that need a special graphic with images, complex designs, gradients, or specific PMS colors should choose this process. 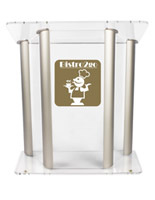 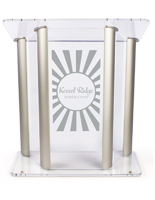 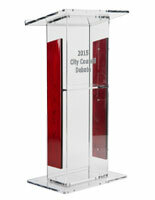 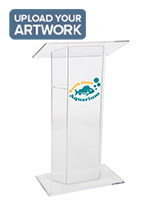 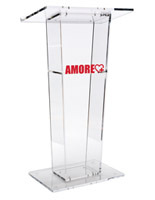 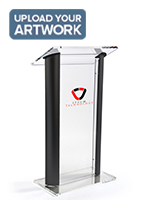 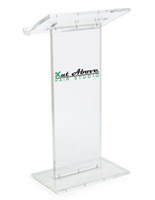 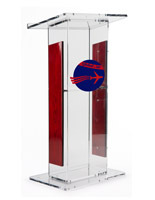 What other options are available with these imprinted podiums? 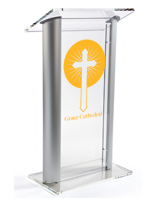 Other than their displays, the custom printed pulpits come in a number of different finishes, from fully clear to sleek wood laminates. 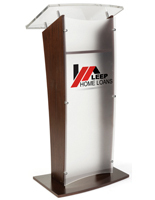 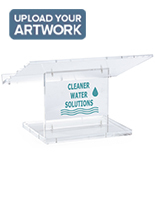 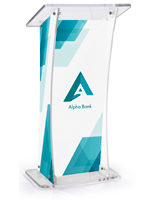 In addition, the lecterns with logo printing are offered in a number of different constructions, including straight, angled and curved that can fit a variety of styles. 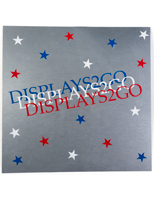 Users also have a choice in the front plate where the image is displayed, as it can be completely see-through or frosted to obscure the inside. 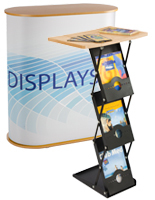 In addition, the event stands can come with an interior shelf for keeping presentation materials like notebooks, tablets and remote controls for projectors. 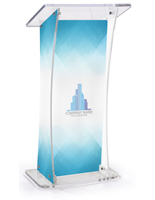 Single-color, 2-color and full color custom printed pulpits are also offered with an extra-wide design for maximum visual impact in any facility. 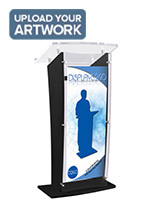 The full variety of speaker's stand designs means that any need can be easily accomodated. 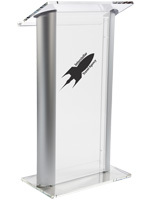 From portable branded lecterns for trade shows, to conference rooms, auditoriums and classrooms, our versatile high visibility presentatation furniture can showcase company, organization, brand, or school names and logos as needed.